Mokyo Octet is the main project of Paul N. Dorosh. The compositions that spill from his brain combine composed music and improvisation. Mokyo Octet originally started in 2006 as a solo project of Paul's combining oud, guitar, and electronics. The group has recently expanded to a four piece unit adding to the mix Indian tabla, violin, and flute. The overall sound of the group is something like a fabric woven from a mixture of threads from different worlds, ancient and new, eastern and western, salty and sweet, avian and piscine. RadioIndy is pleased to announced that we have published our CD Review of onny Mokyo Octet 's music to Amazon. 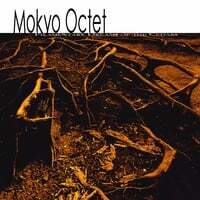 FANS - Please checkout Mokyo Octet's amazon page and sample / purchase some great new music! Thanks! Your review is being processed. Your review will be posted on the site, typically within 48 hours. You'll be able to see the review either on the product page, or on yourprofile page. If your review has not appeared online and you'd like to know why, contact us. RadioIndy is pleased to present Mokyo Octet with a GrIndie Award for the CD "Filamentary Dreams Of The Cedars"
“Filamentary Dreams Of The Cedars” is the superb instrumental world fusion debut from the Mokyo Octet. Now a four-piece, all of the instrumentations and compositions on this particular album can be attributed to composer/oudist/guitarist Paul N. Dorosh. With “Filamentary Dreams Of The Cedars,” Dorosh has crafted seven excellent and uniquely organic tracks that combine traditional Middle Eastern oud, which is a variation on a lute, with modern guitars and electronica beats. The resulting sound varies from track to track, some sounding like jazz fusion and others merely juxtaposing the traditional Middle Eastern sound with modern electronica. It all sounds excellent, and the recording quality really captures Dorosh’s careful musical layering. “Running, Sightless” is aptly titled since it features frantic and excellent oud work and displays Dorosh’s talent both as a composer and an oudist. “Crustacean” closes out the album nicely with a great jazz fusion track with acoustic guitar and Dorosh’s oud work resembling that of a jazz bass line. “Filamentary Dreams Of The Cedars” is an exceptional debut from Mokyo Quartet that leaves you eager to hear what the now-expanded group will put out next. Fans of Middle Eastern music and world fusion should certainly look into this album. "Filamentary Dreams of the Cedars" Reviewed by RadioIndy.com!